The Jesus in the Quran and the Jesus not in the Quran | Is the Quran the Word of God? Below is a list of passages where Jesus is mentioned in the Quran. Quotations taken from the Muhsin Khan Interpretation of the Meanings of the Quran.1This version is often distributed to Hajj pilgrims in Saudi Arabia. Quran 2:87 And indeed, We gave Musa (Moses) the Book and followed him up with a succession of Messengers. And We gave ‘Iesa (Jesus), the son of Maryam (Mary), clear signs and supported him with Ruh-ul-Qudus [Jibrael (Gabriel) ]. Is it that whenever there came to you a Messenger with what you yourselves desired not, you grew arrogant? Some, you disbelieved and some, you killed. Quran 2:136 Say (O Muslims), “We believe in Allah and that which has been sent down to us and that which has been sent down to Ibrahim (Abraham), Isma’il (Ishmael), Ishaque (Isaac), Ya’qub (Jacob), and to Al-Asbat [the twelve sons of Ya’qub (Jacob)], and that which has been given to Musa (Moses) and ‘Iesa (Jesus), and that which has been given to the Prophets from their Lord. We make no distinction between any of them, and to Him we have submitted (in Islam).” Quran 2:253 Those Messengers! We preferred some to others; to some of them Allah spoke (directly); others He raised to degrees (of honour); and to ‘Iesa (Jesus), the son of Maryam (Mary), We gave clear proofs and evidences, and supported him with Ruh-ul-Qudus [Jibrael (Gabriel)]. If Allah had willed, succeeding generations would not have fought against each other, after clear Verses of Allah had come to them, but they differed – some of them believed and others disbelieved. If Allah had willed, they would not have fought against one another, but Allah does what He likes. Quran 3:38-39 At that time Zakariya (Zachariya) invoked his Lord, saying: “O my Lord! Grant me from You, a good offspring. You are indeed the All-Hearer of invocation.” Then the angels called him, while he was standing in prayer in Al-Mihrab (a praying place or a private room), (saying): “Allah gives you glad tidings of Yahya (John), confirming (believing in) the Word from Allah [i.e. the creation of ‘Iesa (Jesus) , the Word from Allah (“Be!” – and he was! )], noble, keeping away from sexual relations with women, a Prophet, from among the righteous.” Quran 3:45-55 (Remember) when the angels said: “O Maryam (Mary)! Verily, Allah gives you the glad tidings of a Word [“Be!” – and he was! i.e. 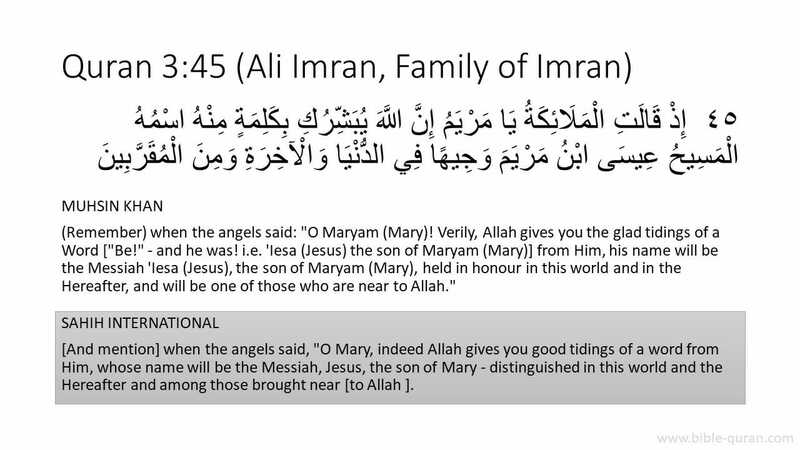 ‘Iesa (Jesus) the son of Maryam (Mary)] from Him, his name will be the Messiah ‘Iesa (Jesus), the son of Maryam (Mary), held in honour in this world and in the Hereafter, and will be one of those who are near to Allah.” “He will speak to the people in the cradle and in manhood, and he will be one of the righteous.” She said: “O my Lord! How shall I have a son when no man has touched me.” He said: “So (it will be) for Allah creates what He wills. When He has decreed something, He says to it only: “Be!” and it is. And He (Allah) will teach him [‘Iesa (Jesus)] the Book and Al-Hikmah (i.e. the Sunnah, the faultless speech of the Prophets, wisdom, etc. ), (and) the Taurat (Torah) and the Injeel (Gospel). And will make him [‘Iesa (Jesus)] a Messenger to the Children of Israel (saying): “I have come to you with a sign from your Lord, that I design for you out of clay, as it were, the figure of a bird, and breathe into it, and it becomes a bird by Allah’s Leave; and I heal him who was born blind, and the leper, and I bring the dead to life by Allah’s Leave. And I inform you of what you eat, and what you store in your houses. Surely, therein is a sign for you, if you believe. And I have come confirming that which was before me of the Taurat (Torah), and to make lawful to you part of what was forbidden to you, and I have come to you with a proof from your Lord. So fear Allah and obey me. Truly! Allah is my Lord and your Lord, so worship Him (Alone). This is the Straight Path. Then when ‘Iesa (Jesus) came to know of their disbelief, he said: “Who will be my helpers in Allah’s Cause?” Al-Hawariun (the disciples) said: “We are the helpers of Allah; we believe in Allah, and bear witness that we are Muslims (i.e. we submit to Allah).” Our Lord! We believe in what You have sent down, and we follow the Messenger [‘Iesa (Jesus)]; so write us down among those who bear witness (to the truth i.e. La ilaha ill-Allah – none has the right to be worshipped but Allah). And they (disbelievers) plotted [to kill ‘Iesa (Jesus) ], and Allah planned too. And Allah is the Best of the planners. And (remember) when Allah said: “O ‘Iesa (Jesus)! I will take you and raise you to Myself and clear you [of the forged statement that ‘Iesa (Jesus) is Allah’s son] of those who disbelieve, and I will make those who follow you (Monotheists, who worship none but Allah) superior to those who disbelieve [in the Oneness of Allah, or disbelieve in some of His Messengers, e.g. Muhammad SAW, ‘Iesa (Jesus), Musa (Moses), etc., or in His Holy Books, e.g. the Taurat (Torah), the Injeel (Gospel), the Quran] till the Day of Resurrection. Then you will return to Me and I will judge between you in the matters in which you used to dispute.” Quran 3:59-62 Verily, the likeness of ‘Iesa (Jesus) before Allah is the likeness of Adam. He created him from dust, then (He) said to him: “Be!” – and he was. (This is) the truth from your Lord, so be not of those who doubt. Then whoever disputes with you concerning him [‘Iesa (Jesus)] after (all this) knowledge that has come to you, [i.e. ‘Iesa (Jesus)] being a slave of Allah, and having no share in Divinity) say: (O Muhammad SAW) “Come, let us call our sons and your sons, our women and your women, ourselves and yourselves – then we pray and invoke (sincerely) the Curse of Allah upon those who lie.” Verily! This is the true narrative [about the story of ‘Iesa (Jesus)], and, La ilaha ill-Allah (none has the right to be worshipped but Allah, the One and the Only True God, Who has neither a wife nor a son). And indeed, Allah is the All-Mighty, the All-Wise. Quran 3:84 Say (O Muhammad SAW): “We believe in Allah and in what has been sent down to us, and what was sent down to Ibrahim (Abraham), Isma’il (Ishmael), Ishaque (Isaac), Ya’qub (Jacob) and Al-Asbat [the twelve sons of Ya’qub (Jacob)] and what was given to Musa (Moses), ‘Iesa (Jesus) and the Prophets from their Lord. We make no distinction between one another among them and to Him (Allah) we have submitted (in Islam).” Quran 4:157-159 And because of their saying (in boast), “We killed Messiah ‘Iesa (Jesus), son of Maryam (Mary), the Messenger of Allah,” – but they killed him not, nor crucified him, but the resemblance of ‘Iesa (Jesus) was put over another man (and they killed that man), and those who differ therein are full of doubts. They have no (certain) knowledge, they follow nothing but conjecture. For surely; they killed him not [i.e. ‘Iesa (Jesus), son of Maryam (Mary) ]: But Allah raised him [‘Iesa (Jesus)] up (with his body and soul) unto Himself (and he is in the heavens). And Allah is Ever All-Powerful, All-Wise. And there is none of the people of the Scripture (Jews and Christians), but must believe in him [‘Iesa (Jesus), son of Maryam (Mary), as only a Messenger of Allah and a human being], before his [‘Iesa (Jesus) or a Jew’s or a Christian’s] death (at the time of the appearance of the angel of death). And on the Day of Resurrection, he [‘Iesa (Jesus)] will be a witness against them. Quran 4:163 Verily, We have inspired you (O Muhammad SAW) as We inspired Nuh (Noah) and the Prophets after him; We (also) inspired Ibrahim (Abraham), Isma’il (Ishmael), Ishaque (Isaac), Ya’qub (Jacob), and Al-Asbat [the twelve sons of Ya’qub (Jacob)], ‘Iesa (Jesus), Ayub (Job), Yunus (Jonah), Harun (Aaron), and Sulaiman (Solomon), and to Dawud (David) We gave the Zabur (Psalms). Quran 4:171-172 O people of the Scripture (Jews and Christians)! Do not exceed the limits in your religion, nor say of Allah aught but the truth. The Messiah ‘Iesa (Jesus), son of Maryam (Mary), was (no more than) a Messenger of Allah and His Word, (“Be!” – and he was) which He bestowed on Maryam (Mary) and a spirit (Ruh) created by Him; so believe in Allah and His Messengers. Say not: “Three (trinity)!” Cease! (it is) better for you. For Allah is (the only) One Ilah (God), Glory be to Him (Far Exalted is He) above having a son. To Him belongs all that is in the heavens and all that is in the earth. And Allah is All-Sufficient as a Disposer of affairs. The Messiah will never be proud to reject to be a slave to Allah, nor the angels who are near (to Allah). And whosoever rejects His worship and is proud, then He will gather them all together unto Himself. Quran 5:17 Surely, in disbelief are they who say that Allah is the Messiah, son of Maryam (Mary). Say (O Muhammad SAW): “Who then has the least power against Allah, if He were to destroy the Messiah, son of Maryam (Mary), his mother, and all those who are on the earth together?” And to Allah belongs the dominion of the heavens and the earth, and all that is between them. He creates what He wills. And Allah is Able to do all things. Quran 5:46 And in their footsteps, We sent ‘Iesa (Jesus), son of Maryam (Mary), confirming the Taurat (Torah) that had come before him, and We gave him the Injeel (Gospel), in which was guidance and light and confirmation of the Taurat (Torah) that had come before it, a guidance and an admonition for Al-Muttaqun (the pious – see V.2:2). Quran 5:72 Surely, they have disbelieved who say: “Allah is the Messiah [‘Iesa (Jesus)], son of Maryam (Mary).” But the Messiah [‘Iesa (Jesus)] said: “O Children of Israel! Worship Allah, my Lord and your Lord.” Verily, whosoever sets up partners in worship with Allah, then Allah has forbidden Paradise for him, and the Fire will be his abode. And for the Zalimun (polytheists and wrong-doers) there are no helpers. Quran 5:75 The Messiah [‘Iesa (Jesus)], son of Maryam (Mary), was no more than a Messenger; many were the Messengers that passed away before him. His mother [Maryam (Mary)] was a Siddiqah [i.e. she believed in the words of Allah and His Books (see Verse 66:12)]. They both used to eat food (as any other human being, while Allah does not eat). Look how We make the Ayat (proofs, evidences, verses, lessons, signs, revelations, etc.) clear to them, yet look how they are deluded away (from the truth). Quran 5:78 Those among the Children of Israel who disbelieved were cursed by the tongue of Dawud (David) and ‘Iesa (Jesus), son of Maryam (Mary). That was because they disobeyed (Allah and the Messengers) and were ever transgressing beyond bounds. Quran 5:110-118 (Remember) when Allah will say (on the Day of Resurrection). “O ‘Iesa (Jesus), son of Maryam (Mary)! Remember My Favour to you and to your mother when I supported you with Ruh-ul-Qudus [Jibrael (Gabriel)] so that you spoke to the people in the cradle and in maturity; and when I taught you writing, Al-Hikmah (the power of understanding), the Taurat (Torah) and the Injeel (Gospel); and when you made out of the clay, as it were, the figure of a bird, by My Permission, and you breathed into it, and it became a bird by My Permission, and you healed those born blind, and the lepers by My Permission, and when you brought forth the dead by My Permission; and when I restrained the Children of Israel from you (when they resolved to kill you) since you came unto them with clear proofs, and the disbelievers among them said: ‘This is nothing but evident magic.’ “ And when I (Allah) put in the hearts of Al-Hawarieen (the disciples) [of ‘Iesa (Jesus)] to believe in Me and My Messenger, they said: “We believe. And bear witness that we are Muslims.” (Remember) when Al-Hawariun (the disciples) said: “O ‘Iesa (Jesus), son of Maryam (Mary)! Can your Lord send down to us a table spread (with food) from heaven?” ‘Iesa (Jesus) said: “Fear Allah, if you are indeed believers.” They said: “We wish to eat thereof and to be stronger in Faith, and to know that you have indeed told us the truth and that we ourselves be its witnesses.” ‘Iesa (Jesus), son of Maryam (Mary), said: “O Allah, our Lord! Send us from heaven a table spread (with food) that there may be for us – for the first and the last of us – a festival and a sign from You; and provide us sustenance, for You are the Best of sustainers.” Allah said: “I am going to send it down unto you, but if any of you after that disbelieves, then I will punish him with a torment such as I have not inflicted on anyone among (all) the ‘Alamin (mankind and jinns).” And (remember) when Allah will say (on the Day of Resurrection): “O ‘Iesa (Jesus), son of Maryam (Mary)! Did you say unto men: ‘Worship me and my mother as two gods besides Allah?’ ” He will say: “Glory be to You! It was not for me to say what I had no right (to say). Had I said such a thing, You would surely have known it. You know what is in my inner-self though I do not know what is in Yours, truly, You, only You, are the All-Knower of all that is hidden and unseen. “Never did I say to them aught except what You (Allah) did command me to say: ‘Worship Allah, my Lord and your Lord.’ And I was a witness over them while I dwelt amongst them, but when You took me up, You were the Watcher over them, and You are a Witness to all things. (This is a great admonition and warning to the Christians of the whole world). “If You punish them, they are Your slaves, and if You forgive them, verily You, only You are the All-Mighty, the All-Wise.” Quran 6:85 And Zakariya (Zachariya), and Yahya (John) and ‘Iesa (Jesus) and Iliyas (Elias), each one of them was of the righteous. Quran 7:158 Say (O Muhammad SAW): “O mankind! Verily, I am sent to you all as the Messenger of Allah – to Whom belongs the dominion of the heavens and the earth. La ilaha illa Huwa (none has the right to be worshipped but He); It is He Who gives life and causes death. So believe in Allah and His Messenger (Muhammad SAW), the Prophet who can neither read nor write (i.e. Muhammad SAW) who believes in Allah and His Words [(this Quran), the Taurat (Torah) and the Injeel (Gospel) and also Allah’s Word: “Be!” – and he was, i.e. ‘Iesa (Jesus) son of Maryam (Mary)], and follow him so that you may be guided.”2Other translations of the meaning of the Quran do not mention Jesus in this verse/aya. Quran 9:30-31 And the Jews say: ‘Uzair (Ezra) is the son of Allah, and the Christians say: Messiah is the son of Allah. That is a saying from their mouths. They imitate the saying of the disbelievers of old. Allah’s Curse be on them, how they are deluded away from the truth! They (Jews and Christians) took their rabbis and their monks to be their lords besides Allah (by obeying them in things which they made lawful or unlawful according to their own desires without being ordered by Allah), and (they also took as their Lord) Messiah, son of Maryam (Mary), while they (Jews and Christians) were commanded [in the Taurat (Torah) and the Injeel (Gospel)) to worship none but One Ilah (God – Allah) La ilaha illa Huwa (none has the right to be worshipped but He). Praise and glory be to Him, (far above is He) from having the partners they associate (with Him).” Quran 17:56-57 Say (O Muhammad SAW): “Call unto those besides Him whom you pretend [to be gods like angels, Iesa (Jesus), ‘Uzair (Ezra), etc.]. They have neither the power to remove the adversity from you nor even to shift it from you to another person.” Those whom they call upon [like ‘Iesa (Jesus) – son of Maryam (Mary), ‘Uzair (Ezra), angel, etc.] desire (for themselves) means of access to their Lord (Allah), as to which of them should be the nearest and they [‘Iesa (Jesus), ‘Uzair (Ezra), angels, etc.] hope for His Mercy and fear His Torment. Verily, the Torment of your Lord is something to be afraid of! Quran 18:102 Do then those who disbelieve think that they can take My slaves [i.e., the angels, Allah’s Messengers, ‘Iesa (Jesus), son of Maryam (Mary), etc.] as Auliya’ (lords, gods, protectors, etc.) besides Me? Verily, We have prepared Hell as an entertainment for the disbelievers (in the Oneness of Allah Islamic Monotheism).3Other translations of the meaning of the Quran do not mention Jesus in this verse/aya. Quran 19:19-37 (The angel) said: “I am only a Messenger from your Lord, (to announce) to you the gift of a righteous son.” She said: “How can I have a son, when no man has touched me, nor am I unchaste?” He said: “So (it will be), your Lord said: ‘That is easy for Me (Allah): And (We wish) to appoint him as a sign to mankind and a mercy from Us (Allah), and it is a matter (already) decreed, (by Allah).” So she conceived him, and she withdrew with him to a far place (i.e. Bethlehem valley about 4-6 miles from Jerusalem). And the pains of childbirth drove her to the trunk of a date-palm. She said: “Would that I had died before this, and had been forgotten and out of sight!” Then [the babe ‘Iesa (Jesus) or Jibrael (Gabriel)] cried unto her from below her, saying: “Grieve not! Your Lord has provided a water stream under you; “And shake the trunk of date-palm towards you, it will let fall fresh ripe-dates upon you.” “So eat and drink and be glad, and if you see any human being, say: ‘Verily! I have vowed a fast unto the Most Beneficent (Allah) so I shall not speak to any human being this day.” Then she brought him (the baby) to her people, carrying him. They said: “O Mary! Indeed you have brought a thing Fariya (an unheard mighty thing). “O sister (i.e. the like) of Harun (Aaron) [not the brother of Musa (Moses), but he was another pious man at the time of Maryam (Mary)]! Your father was not a man who used to commit adultery, nor your mother was an unchaste woman.” Then she pointed to him. They said: “How can we talk to one who is a child in the cradle?” “He [‘Iesa (Jesus)] said: Verily! I am a slave of Allah, He has given me the Scripture and made me a Prophet;” “And He has made me blessed wheresoever I be, and has enjoined on me Salat (prayer), and Zakat, as long as I live.” “And dutiful to my mother, and made me not arrogant, unblest. “And Salam (peace) be upon me the day I was born, and the day I die, and the day I shall be raised alive!” Such is ‘Iesa (Jesus), son of Maryam (Mary). (it is) a statement of truth, about which they doubt (or dispute). It befits not (the Majesty of) Allah that He should beget a son [this refers to the slander of Christians against Allah, by saying that ‘Iesa (Jesus) is the son of Allah]. Glorified (and Exalted be He above all that they associate with Him). When He decrees a thing, He only says to it, “Be!” and it is. [‘Iesa (Jesus) said]: “And verily Allah is my Lord and your Lord. So worship Him (Alone). That is the Straight Path. (Allah’s Religion of Islamic Monotheism which He did ordain for all of His Prophets).” [Tafsir At-Tabari] Then the sects differed [i.e. the Christians about ‘Iesa (Jesus) ], so woe unto the disbelievers [those who gave false witness by saying that ‘Iesa (Jesus) is the son of Allah] from the meeting of a great Day (i.e. the Day of Resurrection, when they will be thrown in the blazing Fire). Quran 19:88-93 And they say: “The Most Beneficent (Allah) has begotten a son (or offspring or children) [as the Jews say: ‘Uzair (Ezra) is the son of Allah, and the Christians say that He has begotten a son [‘Iesa (Christ) ], and the pagan Arabs say that He has begotten daughters (angels, etc. )].” Indeed you have brought forth (said) a terrible evil thing. Whereby the heavens are almost torn, and the earth is split asunder, and the mountains fall in ruins, That they ascribe a son (or offspring or children) to the Most Beneficent (Allah). But it is not suitable for (the Majesty of) the Most Beneficent (Allah) that He should beget a son (or offspring or children). There is none in the heavens and the earth but comes unto the Most Beneficent (Allah) as a slave. Quran 21:26 And they say: “The Most Beneficent (Allah) has begotten a son (or children).” Glory to Him! They [those whom they call children of Allah i.e. the angels, ‘Iesa (Jesus) son of Maryam (Mary), ‘Uzair (Ezra), etc. ], are but honoured slaves. Quran 21:91 And (remember) she who guarded her chastity [Virgin Maryam (Mary)], We breathed into (the sleeves of) her (shirt or garment) [through Our Ruh – Jibrael (Gabriel)], and We made her and her son [‘Iesa (Jesus)] a sign for Al-‘Alamin (the mankind and jinns). Truly! This, your Ummah [Sharia or religion (Islamic Monotheism)] is one religion, and I am your Lord, therefore worship Me (Alone). [Tafsir Ibn Kathir] Quran 23:50 And We made the son of Maryam (Mary) and his mother as a sign, And We gave them refuge on high ground, a place of rest, security and flowing streams. Quran 29:27 And We bestowed on him [Ibrahim (Abraham)], Ishaque (Isaac) and Ya’qub (Jacob), and ordained among his offspring Prophethood and the Book [i.e. the Taurat (Torah) (to Musa – Moses), the Injeel (Gospel) (to ‘Iesa – Jesus), the Quran (to Muhammad SAW), all from the offspring of Ibrahim (Abraham)], and We granted him his reward in this world, and verily, in the Hereafter he is indeed among the righteous. Quran 33:7 And (remember) when We took from the Prophets their covenant, and from you (O Muhammad SAW), and from Nuh (Noah), Ibrahim (Abraham), Musa (Moses), and ‘Iesa (Jesus), son of Maryam (Mary). We took from them a strong covenant. Quran 42:13 He (Allah) has ordained for you the same religion (Islam) which He ordained for Nuh (Noah), and that which We have inspired in you (O Muhammad SAW), and that which We ordained for Ibrahim (Abraham), Musa (Moses) and ‘Iesa (Jesus) saying you should establish religion (i.e. to do what it orders you to do practically), and make no divisions in it (religion) (i.e. various sects in religion). Intolerable for the Mushrikun , is that to which you (O Muhammad SAW) call them. Allah chooses for Himself whom He wills, and guides unto Himself who turns to Him in repentance and in obedience. Quran 43:57-61 And when the son of Maryam (Mary) is quoted as an example [i.e. ‘Iesa (Jesus) is worshipped like their idols), behold! Your people cry aloud (laugh out at the example). And say: “Are our aliha (gods) better or is he [‘Iesa (Jesus)]?” They quoted not the above example except for argument. Nay! But they are a quarrelsome people. [(See VV. 21:97-101) – The Quran.] He [‘Iesa (Jesus)] was not more than a slave. We granted Our Favour to him, and We made him an example to the Children of Israel (i.e. his creation without a father). And if it were Our Will, We would have [destroyed you (mankind) all, and] made angels to replace you on the earth. [Tafsir At-Tabari, Vol:25, Page 89]. And he [‘Iesa (Jesus), son of Maryam (Mary)] shall be a known sign for (the coming of) the Hour (Day of Resurrection) [i.e. ‘Iesa’s (Jesus) descent on the earth] . Therefore have no doubt concerning it (i.e. the Day of Resurrection). And follow Me (Allah) (i.e. be obedient to Allah and do what He orders you to do, O mankind)! This is the Straight Path (of Islamic Monotheism, leading to Allah and to His Paradise). Quran 43:63-65 And when ‘Iesa (Jesus) came with (Our) clear Proofs, he said: “I have come to you with Al-Hikmah (Prophethood), and in order to make clear to you some of the (points) in which you differ, therefore fear Allah and obey me, “Verily, Allah! He is my Lord (God) and your Lord (God). So worship Him (Alone). This is the (only) Straight Path (i.e. Allah’s religion of true Islamic Monotheism).” But the sects from among themselves differed. So woe to those who do wrong (by ascribing things to ‘Iesa (Jesus) that are not true) from the torment of a painful Day (i.e. the Day of Resurrection)! Quran 57:27-28 Then, We sent after them, Our Messengers, and We sent ‘Iesa (Jesus) – son of Maryam (Mary), and gave him the Injeel (Gospel). And We ordained in the hearts of those who followed him, compassion and mercy. But the Monasticism which they invented for themselves, We did not prescribe for them, but (they sought it) only to please Allah therewith, but that they did not observe it with the right observance. So We gave those among them who believed, their (due) reward, but many of them are Fasiqun (rebellious, disobedient to Allah). O you who believe [in Musa (Moses) (i.e. Jews) and ‘Iesa (Jesus) (i.e. Christians)]! Fear Allah, and believe too in His Messenger (Muhammad SAW), He will give you a double portion of His Mercy, and He will give you a light by which you shall walk (straight), and He will forgive you. And Allah is Oft-Forgiving, Most Merciful. Quran 61:6 And (remember) when ‘Iesa (Jesus), son of Maryam (Mary), said: “O Children of Israel! I am the Messenger of Allah unto you confirming the Taurat [(Torah) which came] before me, and giving glad tidings of a Messenger to come after me, whose name shall be Ahmad. But when he (Ahmad i.e. Muhammad SAW) came to them with clear proofs, they said: “This is plain magic.” Quran 61:14 O you who believe! Be you helpers (in the Cause) of Allah as said ‘Iesa (Jesus), son of Maryam (Mary), to Al-Hawariun (the disciples): “Who are my helpers (in the Cause) of Allah?” Al-Hawarieen (the disciples) said: “We are Allah’s helpers” (i.e. we will strive in His Cause!). Then a group of the Children of Israel believed and a group disbelieved. So We gave power to those who believed against their enemies, and they became the uppermost. Quran 66:12 And Maryam (Mary), the daughter of ‘Imran who guarded her chastity; and We breathed into (the sleeve of her shirt or her garment) through Our Ruh [i.e. Jibrael (Gabriel)], and she testified to the truth of the Words of her Lord [i.e. believed in the Words of Allah: “Be!” and he was; that is ‘Iesa (Jesus) – son of Maryam (Mary); as a Messenger of Allah], and (also believed in) His Scriptures, and she was of the Qanitin (i.e. obedient to Allah).4Other translations of the meaning of the Quran do not mention Jesus in this verse/aya. Jesus is the “Christ/Messiah” is a reference to His relationship to the Holy Spirit, the Third Person of the Trinity (see 1 Samuel 16:13; John 1:32-34; 20:22; Acts 2:33-36). There is an historical gap of about 600 years between the Jesus of history and the Jesus of the Quran: The Jesus of Christianity is rooted in the history of the 1st century. The Jesus of the Quran and Islam is rooted in what Muhammad said in the 7th century. A careful study will show that Muslims honor what Muhammad said about Jesus in the 7th century, but Muslims do not honor what Jesus taught, or did in the 1st century. The differences are not only historical but eternal. 2, 3, 4. ↥ Other translations of the meaning of the Quran do not mention Jesus in this verse/aya. 5. ↥ The Quran’s formal rejection of “Trinity” is not the Trinitarian monotheism historically believed by Christians, “[T]he Kur’an formally rejects any doctrine of the Trinity. It should however be pointed out that the Trinity as understood and rejected is not the same as that which is taught by Christian dogma, and defined by the councils which were held before the revelation of the Kur’an. The Kur’anic Trinity seems to be a triad composed of Allah, of Mary his consort and of Jesus their child (cf. V, 116); a concept which is reminiscent on the one hand of the stellar triads of the pre-Islamic Pantheon, and on the other hand of the cult of Mary verging on idolatry practised by certain Christian sects of Arabia, the Mariamites and the Collyridians. It is important to note that the formal denials of the Kur’an are directed towards these views, which are “heretical” from the point of view of Christian orthodoxy itself” (Anawati, G.C. “ʿĪsā.”, in The Encyclopaedia of Islam, ed. P. Bearman et al. [Leiden: Brill, 1986-2004], CD-ROM version; available online at the Internet Archive).